One plus one equals twice the everything. Two cots, two sets of nappies to change, two directions in which to pull mum and dad’s attention. Whether you’ve got twins, two wee singletons, or you’re planning to expand your family, the Doppio by Babyhood is the solution to two-in-a-pram. The Babyhood Doppio stroller is a double pram (from $795) so packed with clever features, the designers must either be parents themselves, or they’ve carefully listened to parents’ gripes about double strollers and set out to solve every single one. For one thing, there’s no need to buy and store a separate bassinet seat, because the genius multi-function seat morphs from bassinet to big kid seat. Unlike many in-line strollers, the child in the lower position has his feet in a foot rest, and out of the storage basket. That means you can do your shopping without your baby boy having to rest his feet on a bag of carrots. The Doppio has two storage areas – a super easy-to-access one at the front that carries three kilograms of gear, and an under-seat basket that carries five kilograms. If you can push them, the Doppio can handle the weight – the seats each carry up to 18 kilograms of child. That means no more three-year-old tragically dragging her feet, declaring that she can’t possibly walk another step. The number of possible seat configurations is 16, a veritable universe of options. The top seat can face in or out, so your baby can see you, or see the world. Siblings can face each other, or if they’re in the middle of a tiff, they can be easily separated. Bassinet seats can go on top, bottom or in both spots, as can the big kid seats. There are also adaptors for infant capsules. If you can imagine it, it seems the Doppio can do it. The entire two seat and frame kit is about 14 kilograms – not bad for such a robust little workhorse. The wheels are EVA, which means you’ll never know the disaster that is getting a flat tyre when you’re out with a toddler and pram full of shopping. 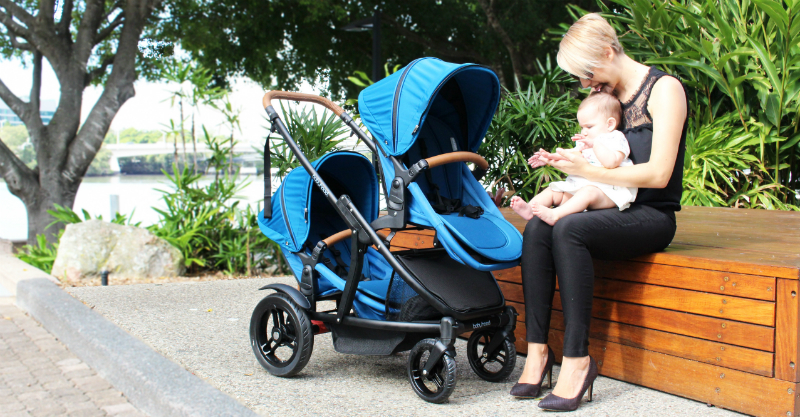 Functionality aside, everyone wants a good-looking pram, and the Doppio is exactly that. The frame is slick black, the handle and seat crossbars have gorgeous cognac faux leather grips, and the seat colours are contemporary charcoal or teal. Named after a double shot of espresso, the Doppio has the most essential of all accessories – a cup holder to carry your own double shot espresso, a drink you’ll surely need if you’re wrangling two kids under three! Add the stroller caddie to carry your long black as well because you’re going to need all the caffeine you can get. 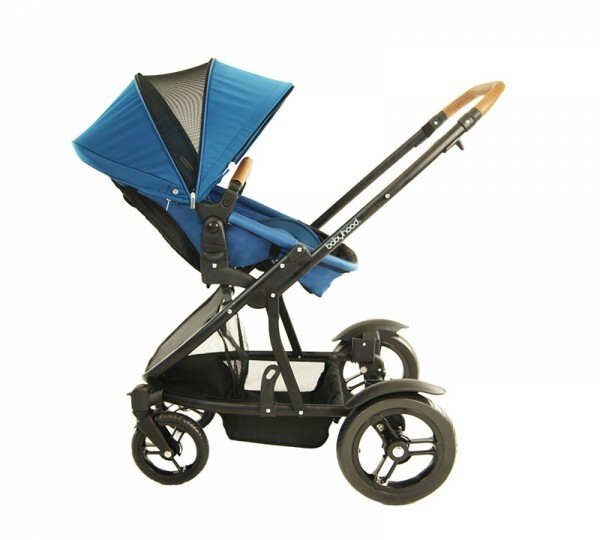 The Babyhood Doppio double pram is available at bricks and mortar stores and online. Use their Store Finder to find your nearest stockist.